Fleet Réalta Corps is a proposed Non-Profit Mutual Benefit Corporation organized as a Federated Union, Cooperative Capitalist, Technocratic Sociocracy, a Culture as a Technology. Though in fundamentals much like a federal credit union, the design of this Federation extends that business model by providing deeply engaged fiscal sponsorship through critical intelligence and infrastructure as a service to a broad constituency of Worker-Owned Maker Cooperatives, and Ancillary Cooperatives, fundamentally enabling economic democracy for social democracy. Federation Cooperatives are in turn, dedicated, both individually and in-union, to the formation of public-private partnerships for reinvention and continuous refinement of, societal-wide critical intelligence systems and cyberphysical infrastructure. The surgical introduction of these instruments, combinate admixtures of software, hardware, and wetware will reduce or eliminate those tasks best suited for machine intelligence, and so afford the allowance of uniquely human engagement of measurably greater potential relevance, and at a level of efficacy and quality formerly deemed too complicated, labor-intensive, and so, too costly for standard practice. This practical focus on serving Worker-Owned Maker Cooperatives is the most objectively effective means known today, of directly placing the most competitive tools of creation and production within the hands of people enabled by true democratic freedoms and so make manifest equal justice for the sake of equal opportunity. The technocratic aspect of the Federation, the organization science, is informed by the interdisciplinary practice of Environmental Psychology, ever seeking to make manifest, those instruments implicit in any just form of social contract defining community. 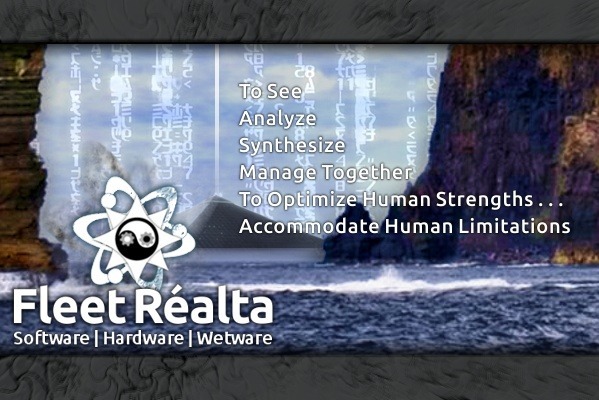 The Fleet Réalta Corps ecosystem affords compatriots the collaborative ability to see, to analyze, and manage together, optimizing human strengths, accommodating human limitations. The agency of the Federation is predicated on personal consent to the disciplined study and practice of an intentional common sense, a meta sense born of evidentiary science. The Cambridge ArtScience Culture Lab, and Café, the MIT FabLab Network, and the Action Design Network have provided significant contributions to the definition of mission and character of this unique federation, its diverse communities of practice. This commercial mission is value-oriented to encourage creative, sustainably productive communities that are healthy, fit, and adaptively resilient for facing life in a volatile world. We do not sell, but instead, consult in the form of participatory action research, and design thought, and count on the apparent prosperity of our patronage to serve as the best form of attraction rather than promotional hucksterism. This is not to say we abandon storytelling, public narratives engage and inform, but simply stated, we own a cardinal value to create and demonstrate works that mainly speak for themselves, works that in form and function, are Indistinguishable From Magic. A year ago my original Dell laptop died from a maliciously delivered cuppa coffee in early 2018. Desperately low on funds, I found a scratch-n-dent HP Stream sub $200 at Best Buy but after only a few months it began showing a BSoD or blue screen of death sometimes several times a day. With Microsoft and HP tech support I've traced the problem down to an irreparable hardware error. Bad enough it's being so low in performance but now I am certain the hour soon will come when I will not find a way to resurrect it from the dead. I need basic tools to form, perfect the foundations of Fleet Réalta, your union. The few additional dollars are for updating software licenses and reconstitute the https://www.discourse.org online forum to serve this cause of democracy reborn.